If you’re searching for Raleigh concrete contractors, employ the best by contacting the experts at Outdoor Pros. Since 1988, we’ve provided full-service landscaping and hardscaping services to Raleigh, Wake Forest and the surrounding areas. At Outdoor Pros, we’ve worked on projects for both residential and commercial clients. Although each type of project requires different skill sets, one of the unifying elements of both projects is concrete work. Whether it’s a crumbling driveway or a cracking sidewalk, nothing blemishes your building’s curb appeal faster than unsightly concrete. And because both sidewalks and driveways are used daily, it’s important to ensure they remain in a safe and attractive condition. Our team of professionals specialize in driveway repair, replacement and installation. Choose from our selection of colored or stamped concrete, or interlocking paver inlays to create cool, custom designs. We’re also bonded, which means we can attain permits from all local cities and towns to replace driveway aprons and curbs, ensuring your newly poured driveway seamlessly matches the existing infrastructure. Although we specialize in driveways, that’s not all we do! Contract our Raleigh concrete specialists to pour patios, ball courts, or parking and RV pads. And because we use proper concrete sealant on our jobs, you can be assured that your patio, driveway or sidewalk will look great for years to come. Outdoors Pros has been locally owned and operated since 1988. Although we’re trusted Raleigh concrete contractors, we also offer a variety of landscape and hardscape services. 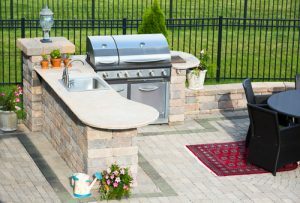 From turf care and maintenance, to drainage and erosion control, and even outdoor kitchen and living space design, we do it all. For a free, no obligation consultation, contact us today. Learn about our rates, services and stellar reputation to see why we’ve been a staple in Raleigh for over three decades.